Day-Lewis said he was "very proud to have been included"
Atonement has been named best film at the Bafta Awards - although some other hotly tipped nominees missed out. As expected, Daniel Day-Lewis was named best actor for his performance in oil prospecting drama There Will Be Blood. But Britain's Julie Christie was pipped to the best actress prize by Marion Cotillard, the French star of Edith Piaf biopic La Vie En Rose. Michael Clayton star Tilda Swinton was also a surprise recipient of the best supporting actress prize. The best supporting actor gong went to Spain's Javier Bardem for No Country For Old Men, which also saw Joel and Ethan Coen named best director. Atonement, a World War II romance starring James McAvoy and Keira Knightley, began the night with 14 nominations - more than any other film. In the end, though, it took home just one other prize - for production design - as well as best film. La Vie En Rose, in contrast, was also recognised for its music, costume design and make-up - giving it four awards in total. Out of the four, it was Cotillard's that took most by surprise. "It has been the most incredible adventure," said the 32-year-old in an emotional speech. "I loved every single second." 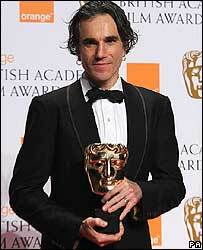 Collecting his prize, Daniel Day-Lewis paid his own tribute to the French star. "Never mind all the other qualities in her astonishing performance," he said. "For sheer balls alone, I feel Marion should have this award as well." The screenplay awards went to Ronald Harwood for The Diving Bell and the Butterfly and to Diablo Cody for US comedy Juno. German drama The Lives of Others, winner of the best foreign film at the Oscars last year, was named best film not in the English language. Sir Anthony Hopkins was presented with an Academy fellowship at the star-studded event, hosted by Jonathan Ross. 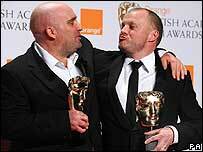 And Shane Meadows was an unexpected recipient of the best British film award, given to his semi-autobiographical skinhead tale This is England. Sylvester Stallone, Cuba Gooding Jr, Jeff Goldblum and Kevin Spacey were among the Hollywood stars to present awards. Eddie Izzard, Thandie Newton and Sir Ian McKellen were among the British talents handing out trophies. Other stars in attendance included Kate Hudson, Jessica Biel and Emily Blunt. The Baftas have taken on a greater significance this year following the cancellation of the Golden Globes in January. The event comes two weeks before the Academy Awards, to be held in Los Angeles on 24 February.